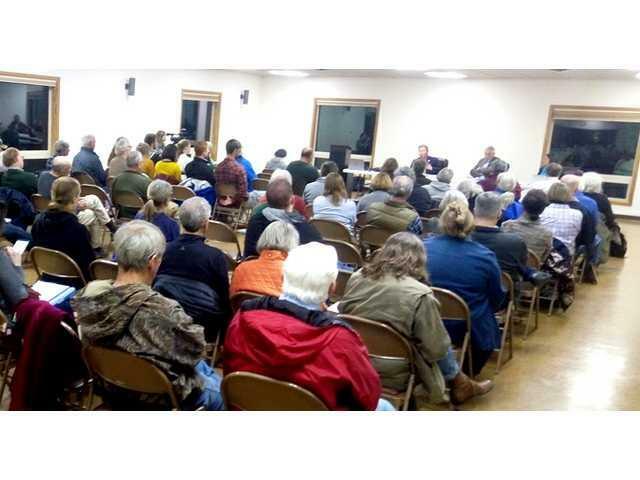 POSTED November 8, 2017 3:33 p.m.
HOLMEN AND ONALASKA - More than 60 residents of the Town of Holmen in LaCrosse County, along with representatives of the Coulee Region Sierra Club, and other concerned citizens gathered in the Holland Town Hall on Tuesday, Oct. 24. The purpose of the gathering was for representatives of the state legislature, the county board, and the county Department of Public Health, to update local residents about the ongoing investigation into contaminated well water in Holland and Onalasla Townships. Wisconsin State Representative Steve Doyle, who represents the 94th Assembly District encompassing rural LaCrosse County, Mike Giese who represents District 17 on the LaCrosse County Board, and Jennifer Rombalski, LaCrosse Public Health Director, each made presentations to the group. Dan Baumann, DNR Natural Resources Manager for the West Central Region, was unable to attend the meeting due to a scheduling conflict. Mike Giese, LaCrosse County Supervisor and Chairman of the County Health and Human Services Board, explained to the group how the county had come to be aware of the well water contamination, and what response they had received from the DNR. Giese told the group that as part of the June 2016 nonpartisan Legislative Audit Bureau (LAB) report, ‘Wastewater Permitting and Enforcement: Department of Natural Resources,’ there were concerns expressed about Babcock Genetics, a permitted CAFO with 1,950 animal units. Sampling of monitoring wells around the operation had shown a pattern of unsafe nitrate levels of greater than 10 micrograms per milliliter (mcg/ml) beginning in 2005. DNR will follow its enforcement policy and issue notices of violations when permittees violate the terms of their WPDES permit. Giese reported that the LaCrosse County Board approved a copy of the resolution at their July 21, 2016 meeting. The board then sent the resolution to Governor Scott Walker, DNR Secretary Cathy Stepp, Senator Jennifer Shilling, and State Representatives Steve Doyle and Jill Billings, requesting a reply within 90 days – by October 22, 2016. The County Board received a reply on October 18, 2016. Upon review of the response by the Human Services Committee, there was agreement that the DNR had not provided the information that the board had requested. The matter was handed off to the executive committee of the County Board. In early December 2016, they were forced to submit four open records requests to the DNR to obtain the data on wastewater violations and DNR enforcement efforts. Data about nitrate levels from the monitoring wells at the CAFO, Jan. 2010 to Nov. 2016, was received in late February 2017. Of the 102 test results, 90 exceeded recommended limits for nitrates. Any concentration of nitrates in well water above 10 mcg/ml is considered unsafe. The purpose of alerting local residents was both to educate them about potential contaminants in their wells, and to urge them to test their well water. In April and May, 560 residents tested their private well water at the Health Department Laboratory for nitrates, bacteria, or both. Of these 542 nitrate tests were completed, with 164 (30.3 percent) exceeding recommended levels of 10 mcg/ml. In addition, 539 bacteria tests were completed with 41 (7.6 percent) having positive results for coliform bacteria; all bacteria tests were negative for E. Coli. Representative Doyle discussed the history of the state’s tarnished history of enforcement of water quality violations. He explained that ultimately, the DNR’s pattern of lax enforcement resulted in the intervention of the EPA, which decided that the State of Wisconsin had not shown adequate competence to be in charge of administering the provisions of the Federal Clean Water Act in the state. Permits that are not reissued before expiration are administratively extended and become part of a permit backlog. Staff of the U.S. Environmental Protection Agency (EPA) indicated that the size of a permit backlog is one indicator of how well a state’s wastewater program is administered. DNR met its goal between 2005 and 2015 of having no more than a 15 percent backlog for CAFO permits during nine of these 11 years. DNR policy establishes various enforcement actions that are based on the severity of permit violations. The extent to which [notices of violations] were issued varied among DNR’s five regions, as did the frequency with which DNR took enforcement actions for CAFO permittees. At the meeting, Doyle pointed out that the $5-7 million collected annually from permitting and penalties of CAFOs, only $90,000 of it is going into enforcement and the rest goes into the state general fund. Changing this, he believes, could provide the necessary funding to hire sufficient staff to effectively administer the program. Babcock Genetics, which advertises themselves as a ‘worldwide supplier of swine genetics,’ had a WPDES permit that expired on September 30, 2016, and it remains expired. Baumann informed Giese that the facility had been issued no penalties over the last 10 years, and that the DNR had added four more staff who would perform additional inspections of permitted CAFOs in the state going forward. Concern was expressed by residents in attendance at the meeting that large dairies in the area, below the threshold to be considered a CAFO, might be contributing to the problem as well. One meeting participant brought up the issue of the area’s underlying karst geology. The question was raised about whether different regulations should be put in place to protect local residents, similar to those being developed for Kewaunee County. Director of LaCrosse County Public Health Jennifer Rombalski shared the county’s plans to address the situation. Rombalski will pursue a $10,000 grant from the U.S.Center for Disease Control’s Environmental Health Tracking (EHT) program. The purpose of the program is to deliver information and data to protect the nation from health issues arising from or directly related to environmental factors. “Our goals, are to identify the source(s) and stop the pollution, and to formulate policy recommendations,” Rombalski explained. “Though the outcome with the Nitrate Task Force here in LaCrosse County will be policy-oriented, we certainly hope that Jennifer and her team will work with state legislators to help make recommendations for legislative changes as well,” Doyle said. “The good news is that if the source of the nitrate contamination can be identified and stopped, the nitrates will deteriorate over time,” Rombalski told the group. The public health director emphasized that while elevated levels of coliform had been detected in some of the well water tests, thankfully, they had not seen elevated levels of E.Coli. Rombalski told the group that the main populations that are vulnerable to high levels of nitrates are women who are pregnant or of childbearing age, and infants less than six months old. She said that exposure to high levels of nitrates in water can interfere with childhood development, and may be connected to an increased risk for diabetes, cancer and thyroid problems. “Until you test your water, you should be using bottled water,” Rombalski said.